This narrative by Jack Delaney, 757th Bomb Squadron waist gunner on Lt Purman`s B-24 crew as told to Tom Whiteleater whose father, S/Sgt Wayne B Whiteleather, also was a gunner on this crew concerning their crash landing on the tiny island of Vis, off the east coast of Yugoslavia. 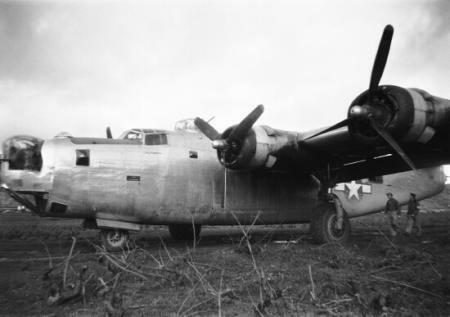 That particular raid was a "full group effort" with all available 459th aircraft (34 plus) in the air plus elements of other B-24 (and B-17) groups. Our group leader, who did not have the best reputation in the enlisted ranks, was an unfortunate choice on such a "hard luck mission". I recall that he flew us blind through a heavy cloud formation while we were in tight formation; wing tip to fuselage with each other. We could not see the other guys in formation but we could hear their engines and feel their prop wash, just feet away. When we broke out of the clouds there were planes from various different groups all over the sky, some wearing squadron insignias I had never seen. Plus strict radio silence in force. After we managed to re-form to some semblance of order, our leader dove us from a good altitude in the clear down to a low level (to regroup, I guess). What does this have to do with Vis? Fuel consumption. By now, having enough gas to hit the target and get back to Italy will take something like divine intervention. However, we hit the target and head for home but not without engine damage and an inability to maintain enough sufficient altitude to feel good about clearing the mountains that lie between us and home base. But our Navigator managed to get us in sight of the Adriatic. Vis is a tiny Island just 5 or ten miles off the coast of Yugoslavia, protected by the English. It has one road lying East and West with an upward slope of about seven to ten degrees from its water level to the crest of the high about one half mile to the West, plus it is strewn with American aircraft which managed to reach it (in one fashion or another) after leaving previous missions. So here we come, our Pilot, as I recall, has one shot straight in over the water to hit the "uphill" run-way (road), hoping we can land and stop before we run out of hill without hitting any of the planes and parts thereof, that are already littering the landscape. Nobody on board was hurt. We were given mess kits and put in a chow line of other crews (about 100 guys) waiting to be fed. We slept in private homes either on Vis or a place called Split, Yugoslavia. We hung out for a couple of days then a 15th air force aircraft (a B-17 wouldn't you know) took us to Rome (1 day) and to Bari (1 day) and then back to squadron and back to work. Well, that's the Vis story as told to me by Jack. I've included a couple items, one is a picture of the plane after the forced landing on Vis. That is Pilot Lt. Purman and copilot Jack Campbell checking out the damage on their B-24. The other item is the news article about my Dad returning after missing in action.